Making sure your car is ready for winter is easier than you think. There is no need to take it to a mechanic because you can do it all yourself. Before the cold sets in, use this checklist to make sure you are ready to go. There are three important fluids that you should make sure are full, the oil, coolant, and wiper fluid. Each has an important role in making sure that you drive safely through the winter months. Oil– When temperatures drop below freezing, most mechanics recommend replacing the regular oil in your car with a thinner oil. This helps combat the freezing temperatures better. To know which oil is recommended for your specific vehicle, look in your owner’s manual or a mechanic you trust. Coolant– Test to make sure your coolant is filled all the way up to the maximum line. 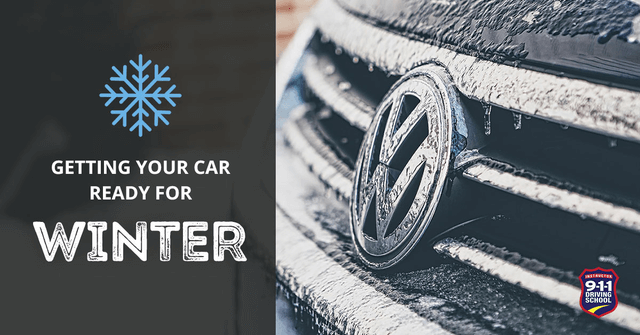 This is important because the mixture of antifreeze and water will help prevent freezing liquid inside your radiator, causing a lot of internal damage to your car. If you aren’t sure what mixture is ideal for your vehicle, it is listed in the owner’s manual. Wiper fluid– Even though washing your windshield isn’t at the front of your mind in the cold weather, it is important that you have a full amount of windshield washing fluid. If you live in an area that gets a lot of snow and slush on the roads, you know that other cars on the road kick up a lot of junk onto your windshield. This doesn’t just wipe off easily either. Wiper fluid is vital to getting your windshield clean and keeping you safe. There are three basic things to check on your tires. Check the tread on your tires. The last thing you need is to lose your grip on the road because your tires are bald. Not having an adequate amount of tread also makes slippery roads even more dangerous. Check the tire pressure. The right PSI on your tires should be at the recommended amount. Colder temperatures cause tires to deflate a little, losing pressure that is necessary to good gas mileage. Switch your tires. If you live in an area with a lot of snow, it might be a good idea to switch out your regular tires for snow tires once it starts getting cold. Make sure you switch all four tires. Many experts recommend changing out your windshield wipers every six months. Changing them out at the beginning of the fall and winter seasons can save you a lot of grief when old ones don’t work as well during a storm. Snowstorms, ice storms, and even rainstorms can leave you stranded in your car. Here are some good things to keep in your car for a safety kit, just in case. Following these steps should ensure your car is ready for winter. The last thing to keep in mind is that if your car is having any problems or needing major maintenance done on it, get it all taken care of. The last thing you need is to be stranded in the cold for a problem you could have prevented. The more you prepare, the less problem solving you will have to do.